Russia's President Vladimir Putin has cancelled a planned visit to France amid a row over Syria. He had been due to meet French President Francois Hollande and open a new Orthodox church later this month. But after France's government said talks would be confined to Syria, the visit was halted, French presidential sources said. On Monday, Mr Hollande suggested Russia could face war crimes charges over its bombardment of Syria's city of Aleppo. The French presidency had told the Russians Mr Hollande would attend only one event with Mr Putin during the visit planned for 19 October - a working meeting on Syria, according to the sources. But after this Russia "let it be known that it wanted to postpone the visit", they added. A spokesman for Mr Putin confirmed the trip had been cancelled, adding that the visit would take place when it becomes "comfortable for President Hollande". 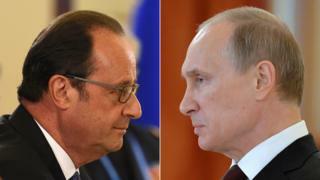 Despite this Mr Hollande has said he will meet Mr Putin at "any time" if it would "further peace". Is a no-fly zone the answer? The development comes a day after Mr Hollande told French TV that prosecutions over Syria could take place in the International Criminal Court (ICC). "These are people who today are the victims of war crimes. Those that commit these acts will have to face up to their responsibility, including in the ICC," he said. On Tuesday UK Foreign Secretary Boris Johnson said Mr Putin's strategy of restoring Russia's greatness was at risk. "If Russia continues in its current path then I believe that great country is in danger of becoming a pariah nation," he told the UK parliament during a debate on the Syrian crisis. Neither Russia nor Syria is a member of the ICC. Moscow has repeatedly denied attacking civilians, and says it targets terrorist groups in Syria. The besieged east of Aleppo has come under intense aerial bombardment since a cessation of hostilities brokered by the US and Moscow collapsed last month. The area was hit again on Tuesday in some of the heaviest air strikes in days, a monitoring group and activists said. At least 12 civilians were killed in the strikes and considerable damage was inflicted on several areas, according to the UK-based Syrian Observatory for Human Rights. The observatory said Russian war planes had dropped so-called "bunker busters" and other bombs, with children thought to be among the dead. Some of the most intense attacks have come in the Bustan al Qasr neighbourhood near the citadel, which sits near the front line with the government-held west. 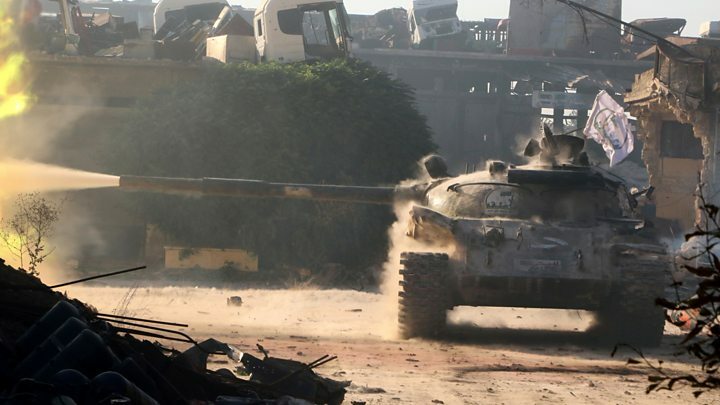 The strikes followed a temporary lull in the bombardment called by the Syrian government, partly to allow civilians to leave opposition-held eastern areas of the city. Aid organisation Medecins Sans Frontieres said on Tuesday there were now only 11 working ambulances left in the city because five had been hit by bombs and another eight were missing essential spare parts. Diplomatic efforts to revive the ceasefire have so far come to nothing. The UN has warned that eastern Aleppo, where an estimated 275,000 people still live, could face "total destruction" in the space of two months. Last week, Russia vetoed a UN Security Council resolution drafted by France calling for an end to the bombing in Aleppo.